About a week ago, we reported that a Colombian retailer had leaked the design and technical specifications of Moto G5 Plus. And now, Evan Blass who goes by the name evleaks on Twitter, has leaked a set of press renders of the device. The new pictures are a direct match for the previously leaked design. To be precise, the new leak is of the Moto G5 Plus Verizon variant. 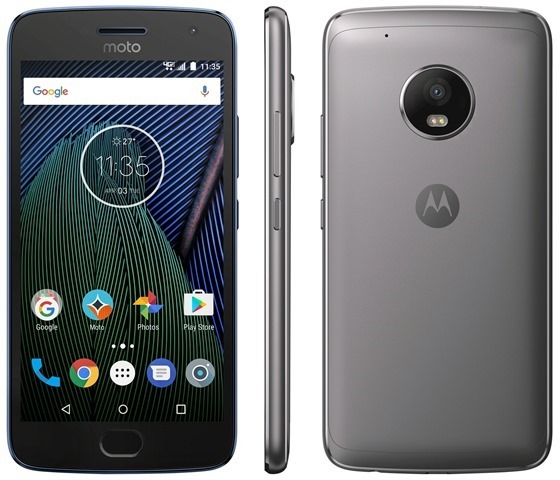 There is no Verizon logo on it yet, but there is a moto logo on the front. From the normal angle, the Moto G5 Plus looks pretty bad. There are large bezels above and below the display, but the side bezels are what seems to be an eye sore. The rear camera has a bump, which is sure to annoy users. Motorola should have included a battery bigger than the 3000mAh one, to make the device thicker, and this way avoiding the ugly bump. It looks more like a Lenovo device to be honest. The date on the device’s homescreen, which reads April 3rd, also seen in the previous leak, hints that the phone may be sold from the 2nd Quarter of 2017. But the Moto G5 Plus will reportedly be launched on February 26th at MWC 2017. The delay is possibly to launch the device across the world simultaneously.